Surely, a washing machine never made it into anyone’s packing list, no matter how essential it can be on long trips that span for at least a week. This is why some travelers would just overpack (uh-oh) or if not, once there is ever a need to do the laundry, 3 choices would often come to mind: pay for a laundry service, hand wash the clothes in a questionable sink, or reuse the dirty clothes (yikes). Most of the time, these 3 options are not so ideal — expensive, tiring, icky — so is there a better choice? Thankfully, an Aussie guy invented the world’s first-ever portable “washing machine” that can wash your clothes in just under 30 seconds! Introducing… the Scrubba Wash Bag! » What is a Scrubba Wash Bag? Weighing less than 5 oz. 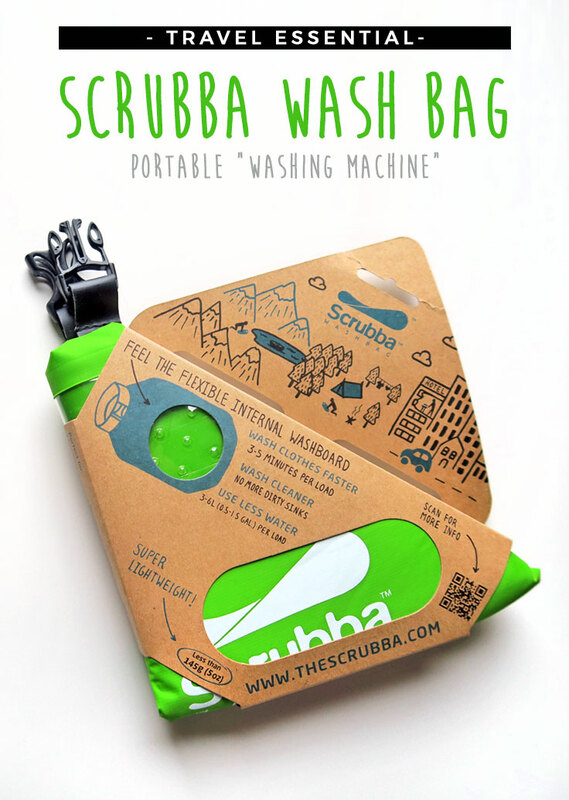 (or 145 grams), the Scrubba™ Wash Bag is the world’s lightest and most compact “washing machine” (when rolled for storage, it can be at around 6 x 2 inches only). To be more precise, it’s like a portable washboard but unlike the traditional washboards that we have, this won’t take up so much space in your carry-on luggage or backpack. With these in mind, you can absolutely do your laundry anywhere and anytime — there’s no need for electricity and it only requires a small amount of water. » How does the Scrubba Wash Bag work? Like I’ve mentioned, the Scrubba Wash Bag functions like a washboard but with a modern twist! With its internal Scrubba™ nodules, it efficiently cleans your clothes in a jiffy and the wash always ends up like ‘washing machine quality’! RINSE. Unclip and unroll the the Scrubba Wash Bag and then pour out the water. Rinse clothes by simply filling it up with water and then shaking it. DRY clothes! It’s that easy! » What are the advantages or benefits? Wash clothes FASTER. As mentioned, you can do a quick wash for only 30 seconds, or if you want a machine-quality wash, you can do it in just under 3-5 minutes. Wash CLEANER. Say goodbye to dirty or questionable hostel sinks and tubs! LESS expensive. As compared to when you pay for a laundry service in your hotel for example. NO pain as compared to handwashing which often leaves me with coarse skin and red knuckles. TWICE as effective as when you hand wash your clothes! PEACE of mind. No matter if you’re just packing a small carry-on or a month’s worth of clothes, you got it covered! Has TONS of uses. You can use it as a dry bag, or later on use it for your delicates at home, or for when you’re out camping, hiking, backpacking, back to the dorms, etc. Use of LESS water. Each load on a Scrubba Wash Bag can only be about 2-6 liters! So as a traveler, you’re helping in conserving more water. The Scrubba Wash Bag is an absolute travel essential for any traveler on the go. With the range of benefits that it offers, it’s sure to be a great companion for your adventures! The only ‘con’ that I see for this is that it’s a bit on the pricey side. At retail price, it’s at $49.95 — but sure enough, it’s a worthy investment that will save you a lot of time, money, and effort in the long run! To purchase it at this discounted price, head on over to Eartheasy, an eco-friendly online store that promotes sustainability. Besides, as you purchase from their store, a portion of the proceeds goes back to providing clean drinking water to areas around the world that need it such as the World Vision Emergency and Preparedness Fund, Rift Valley Reservoir Project in Kenya, and more! So what are you waiting for? Come and grab your own Scrubba Wash Bag NOW! DISCLAIMER: I received this product for free from Eartheasy in return for an honest review. As always, I only recommend and write about brands that I personally use or believe in. Therefore all views that are expressed here represent only those made by myself and NOT of any other entity in their favor. What do you think of the Scrubba Wash Bag? Do you see yourself using this product for your travels? Great idea! Would love one but it is nowhere to be found in South East Asia except Chiang Mai. Bummer! I'll make it a point to check it out when I'm that area next. Looks like a really great idea! What a wonder!!! Thanks for this tip. haha....... they stole my idea i have been using for years. I just have a strong plastic bag and do the same when im on the road, in a river too and dry the clothes on the hot rocks........... but they have make it a bit better and modern i think than mine. I must find my photos and write a post. This product looks incredible, a perfect gift for anyone who likes traveling a lot but does not want to carry a heavy baggage of clothing. Does it come in only one size and color? I can imagine how it washes clothes without damaging the quality. Invented by an Aussie - yay! I've never seen anything like this either and since I travel a lot in motorhomes, it would also be useful. The price is definitely the "con" so I agree with you. AT $50 US that's even more expensive for me. Must check out if they are sold in Australia too. Hey! This is really nifty, I like it. Super handy and easy to move around. Is the material pretty sturdy? What a genius idea! We love finding out about new things like this, thanks for sharing! We will have to get one of these before our next trip! Hi! I really like this post, it's really interesting. Are you currently in Antwerp, Belgium? If you need a guide to discover Antwerp (what to see, eat...) you should check our site. We are happy to help you! No, I live in Italy! When you'll come in our country we'll happy to help you! Thanks for the offer! <3 Likewise! I've never heard of this before but it sounds brilliant!